Welcome Spring on the trails! 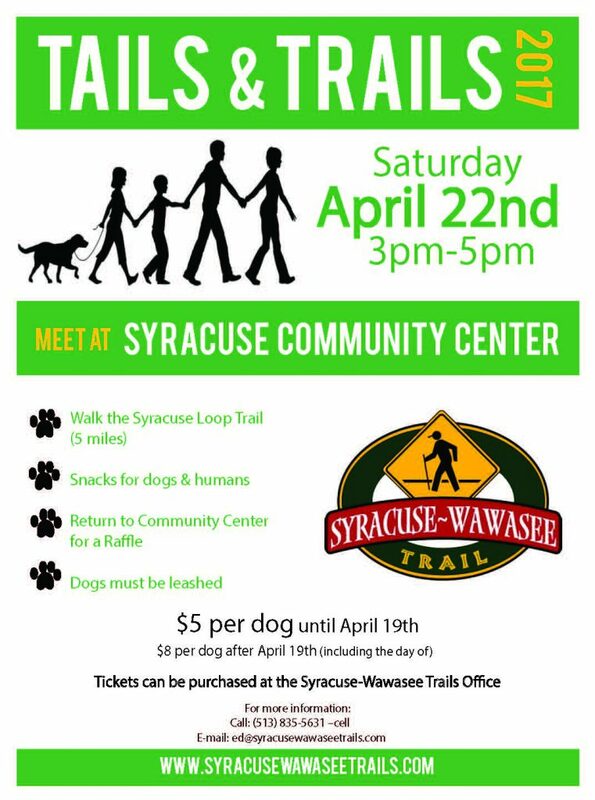 We will be having our 3rd annual Tails and Trails community dog walk on Saturday April 22nd from 3-5pm. We will meet at the Syracuse Community Center and walk the 5 mile Syracuse Lake Loop. There will be snacks for dogs and humans, plus a raffle when we return. Bring a dog or play with those brought by others. Cost is $5 per dog till April 19th ($8 per dog thereafter). 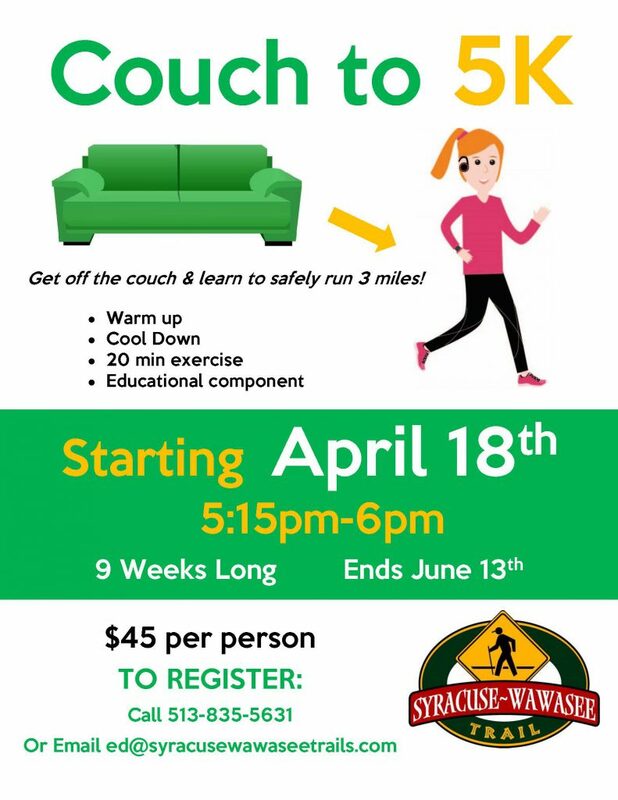 To register contact Megan McClellan on her cell phone at (513)835-5631 or via e-mail at ed@syracusewawaseetrails.com. This Spring the trails will be hosting a class where you can learn to run even if you have always been a couch potato. This 9-week course will meet each Tuesday at 5:15 starting April 11th to go over tips and tricks and then do a group walk/ run for 20 minutes. You start slow (mainly walking) and work your way up to, at the end of the 9 weeks, being able to run for 20 minutes straight. Cost is $45 for the 9 weeks. To register contact Megan McClellan on her cell phone at (513)835-5631 or via e-mail at: ed@syracusewawaseetrails.com. Check out the latest newsletter. Be sure to mark your calendars with all the great events we have lined up for this year. Learn more about getting off the couch and learning to run a 5K as well as how trails make a town more livable. For the full digital version click here. Don’t miss out on all the fun we have coming up this winter! The first event you’ll want to check out is the Winter Carnival in Syracuse, Indiana on January 28, 2017. To participate in the Winter Warm Up 5k, you will need to register the day of as we have now removed our online registration. Click here for a downloadable map of the route for the 5k. Check back for more winter events we will be adding in the coming month to our Events page and calendar. The Laudeman Family Foundation has generously offered to match all individual contributions this Holiday Season up to $40,000. 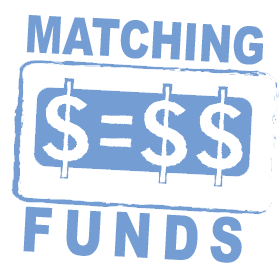 Donate NOW to double your impact for the trail. Your $150 contribution is worth $300 towards a more connected community through safe, multi-use trails. Thank you! The Early Fall edition of the Syracuse-Wawasee Trails newsletter is now available. This newsletter (Newsletter Fall 2016) has articles on this year’s record breaking Tour des Lakes, how to properly fit a bicycle helmet and a beautiful trail that committee chair Dr. Erick Leffler visited in Scotland. Also included are the Fall events calendar and more. The Spring edition of the Syracuse-Wawasee Trails newsletter is now available. This newsletter (Spring 2016 Newsletter) focuses on the Conklin Bay boardwalk, with articles on Pisgah Marsh’s boardwalk, the amenities at WACF that will be reached by the Conklin Bay boardwalk, as well as our Summer events calendar and more. We have received a preliminary estimate for the cost to construct a nearly one-mile long trail segment that will include a boardwalk across the Conklin Bay wetlands and a trail parallel to SR 13, to Grandview Drive. *$1.7 million*. For more information see this Inkfree Press article. The community events calendar is now updated for 2016. Check out all the amazing things to which you can walk or ride your bike this year. Also the map is now interactive, similar to Google maps. Check it out and let us know what you think of the new format. The Fall edition of the Syracuse-Wawasee Trails newsletter is now available. Click on this newsletter link for articles on Tour des Lakes, an update on the Conklin Bay trail segment, Safe Routes to School and more.